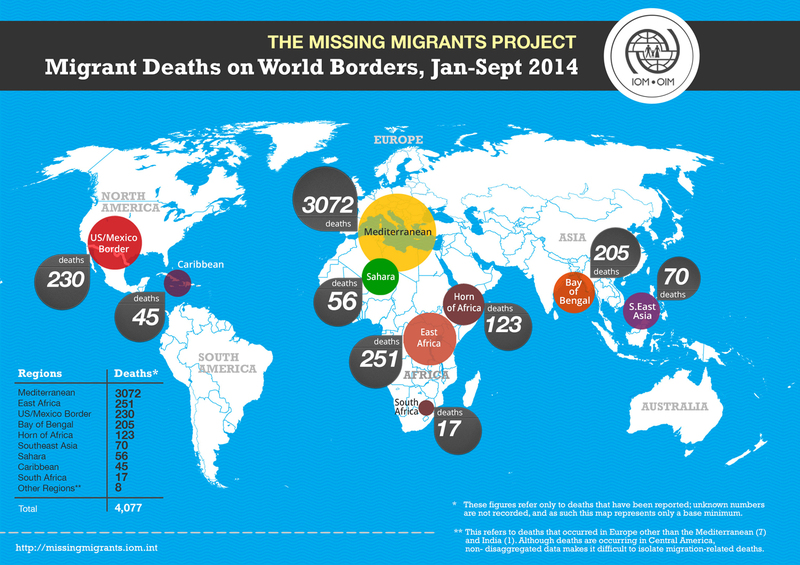 Geneva - IOM today (29/9/2014) released of “Fatal Journeys: Tracking Lives Lost During Migration,” the world’s most comprehensive tally to date of migrant fatalities across land and sea. The research behind “Fatal Journeys,” which runs to over 200 pages, began with the October 2013 tragedy when over 400 migrants died in two shipwrecks near the Italian island of Lampedusa. Calculations based on incidents compiled by The Migrants Files, a joint project conducted under the aegis of Journalism++ , suggests over 22,000 migrants have died trying to reach Europe since 2000, mainly on treacherous routes across the Mediterranean Sea. Besides counting fatalities, the Missing Migrants Project is part of a broader effort to use social media to engage communities around the world. With this month’s Malta shipwreck tragedy, IOM offices worldwide received calls and emails from family members across Europe and the Middle East seeking news about their missing relatives, many of whom are now feared dead. Going forward, the Missing Migrants Project will lend a powerful voice of deterrence to keep future victims from embarking on these dangerous journeys. “People are already looking for information about missing migrants on Facebook. We know as well that people are trafficked around the world using Facebook and other social media,” says IOM spokesperson Leonard Doyle. “We want to turn #MissingMigrants into a powerful voice to warn future migrants against taking these high risk journeys. It is not doing it with a poster or a radio spot, but with the most persuasive means out there - the voices of survivors and the family members of missing migrants,” he adds. ”Fatal Journeys” notes that since 2000 nearly 6,000 more migrant deaths occurred along the U.S.-Mexico border and another 3,000 deaths from such diverse migration routes as Africa’s Sahara Desert and the waters of the Indian Ocean. The true number of fatalities is likely to be considerably higher. “Fatal Journeys” uses statistical data compiled by governments and other agencies, as well as NGOs and media sources, but collecting data on migrant deaths has never been a priority for most governments around the world. “Although vast sums of money are spent collecting migration and border control data, very few agencies collect and publish data on migrant deaths,” says IOM Head of Research Frank Laczko. Many deaths occur in remote regions of the world and are never recorded. No organization at the global level is currently responsible for systematically monitoring the number of deaths which occur. According to Laczko, data tends to be scattered, with a range of organizations involved in tracking fatalities. Some experts now believe that for every dead body discovered, there are at least two others that are never recovered. IOM believes the publication of “Fatal Journeys” will begin to provide some clarity to what many consider to be a growing epidemic of crime against migrants. It represents an initial step towards a more comprehensive accounting of what is happening to the victims and a wake-up call for governments. “The paradox is that a time when one in seven people around the world are migrants, we are seeing an extraordinarily harsh response to migration in the developed world,” says IOM Director General Swing. “Limited opportunities for safe and regular migration drive would-be migrants into the hands of smugglers, feeding an unscrupulous trade that threatens the lives of desperate people. We need to put an end to this cycle. Undocumented migrants are not criminals. They are human beings in need of protection and assistance, and deserving respect,” he adds.